Worst months to sell a home across the U.S.
Year after year, we hear that spring is the best time to sell a home due to the influx of spring buyers who drive up prices. We weren't sold on this idea, though, and decided to explore selling trends in each state. We broke out each state based on monthly selling trends, including the average number of days on market and the ratio of listing price to final sales price. What we found was relatively surprising—spring proved to be the worst time of year to sell a home in 28 states and the District of Columbia. Why? In many cases, the spring market is flush with buyers and sellers, so buyer demand is negated by a steady supply of homes for sale. When buyers have more homes to choose from, homes can stay on the market for longer and end up selling for less. Next week, we'll show you the best months of the year to sell across the U.S. 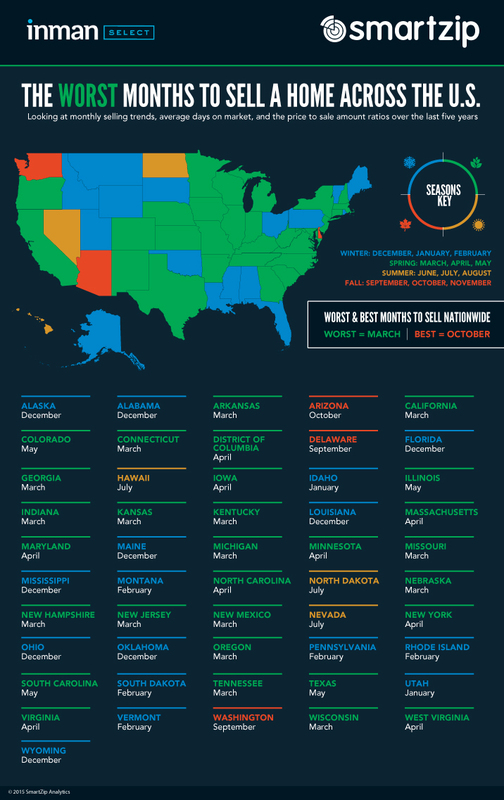 The worst months to sell a home across the U.S.